…I thought I would share my teaching that I give all our pilgrims at this site. It is an explanation of St. John 21 where Jesus appoints Peter to be the shepherd of his sheep. (see my YouTube video below). But there is much more here than meets the eye when you first read John 21, especially if you are reading in English. 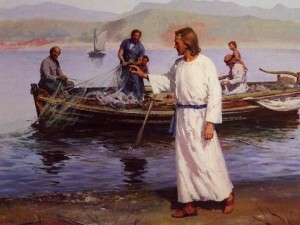 What does the net, the 153 fish, the shoreline and the water represent? Did you know that Jesus and Peter used two different Greek words for “LOVE” in their dialog – but there is only one word used in English? Why couldn’t Peter say he really loved Jesus but was only his good friend. This is a sample of the teaching I give at the holy sites in the Holy Land and I hope you enjoy what our group is listening to today :-) This is my whole 20 minute talk expounding on John 21. You’ve heard the question “What Would Jesus Do?” The popular culture has hijacked this question for all sorts of beliefs and agendas. In his new book Tom Nash asks a far more important question and one that can be more definitively answered. 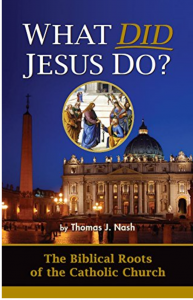 The title of his book is appropriately “What Did Jesus Do?” With his reputation as an EWTN theological advisor, a regular on Catholic Radio and other credits galore, this book should catch everyone’s attention. Accessibly written for beginners; richly biblical and theological for the veteran. To get your own copy or to learn more, click here.